Housing Bubble? Don’t Be So Sure. The Colorado market has seen significant price increases over the last few years. This has lead many of us to believe that we are headed for another housing collapse. While over inflated prices can be an indication to a looming market correction, it is not the case for the Colorado market currently. Black Knight Financial produces a Monthly Mortgage Monitor where they look at delinquencies and foreclosures for each of the 50 states. 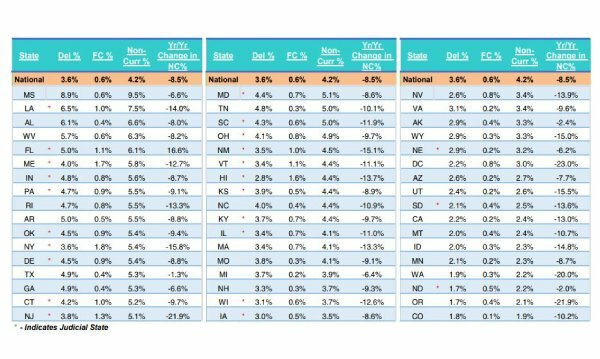 As you can see from the chart pictured, Colorado has the lowest percentages of foreclosures and non-current mortgages than any other state. This tells us that while the price jumps have been driven by low supply and high demand, there is in fact a strong economy backing up these purchases. People are buying homes that they can afford and the prices are not over-inflated. While rising prices can intimidate potential buyers, it should be reassuring that you likely won’t be overpaying in the current market.